"... This is the best crust for making homemade pizza that I have ever used! ...."
"I love that the dough is already so nicely rolled out on a parchment paper, and not frozen but fresh! So there is no sticking and no fighting with the rolling pin." "I NEVER buy store bought pizza crust bc they never turn out right for me for some reason...this was a total hit, it was easy to make, and tasted delicious!!" "Your pizza dough is the best. Easy to use just roll out and top. It is delicious too!!" "Love how easy these made it to have dinner on the table quickly." "The puff pastry is fantastic! I love using it to make turnovers, really flaky and tasty. Best on the market." A Better Way to Bake. Experience the exquisite European taste of bakery style creations, right in your own kitchen. 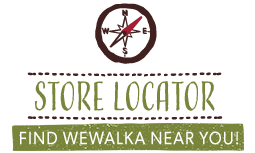 Wewalka refrigerated dough products are now available right here in the USA to help you quickly and easily prepare inspired recipes with perfect results. 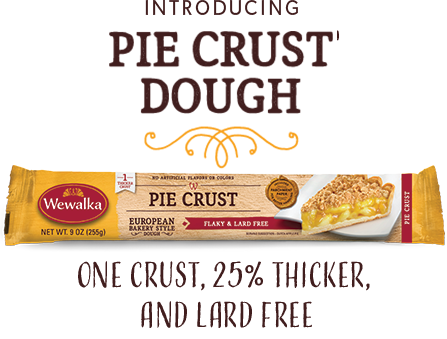 Prepared in the classic tradition using recipes perfected over time, Wewalka incorporates authentic European taste into each of our specialty doughs. From pizza dough inspired by the trattorias in Naples to the flaky croissants baked in Parisian cafes’ to the delicious pastries prepared in Austrian bakeries, Wewalka brings you the true taste of the old country. This commitment to traditional baking is why 8 out of 10 U.S. consumers prefer Wewalka over their current refrigerated dough brand*. Taste for yourself, and see the difference the right dough can make. There are no shortcuts. Premium ingredients combined with the highest standards ensure the best baking results. 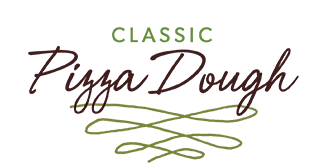 All of Wewalka’s dough products are carefully prepared to provide superior taste and a tantalizing presentation. Great food punctuates every occasion. Whether you are baking for yourself, your kids or that special someone, Wewalka helps you create delicious mealtime memories. So show the people in your life how you really feel. Bake up those appetizers, serve up that entrée, and celebrate with pastry. Wewalka wants to help you bring friends and family together while warming up your love for baking. Our extra thin and crispy Flatbread Dough is the first flatbread sold refrigerated and ready to use. Wewalka Flatbread Dough is made with unbleached, pure wheat flour. Simply unroll the dough on the enclosed parchment paper, then sauce, top and bake or grill. Cut and use for sandwiches too. Create an authentic restaurant experience at home! Made with European olive oil, Wewalka Classic Pizza Dough has a truly unique taste and texture. Slightly thicker than the Bistro dough, it provides a Classic Pizza crust that is ready to be paired with your favorite toppings. Sized to serve the whole family, no one will leave the table unhappy. 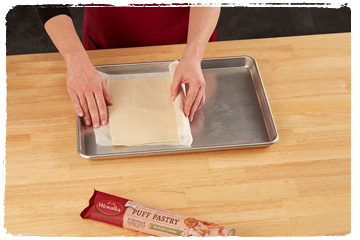 Wewalka Puff Pastry dough is created by layering delicate dough 64 times before carefully rolling onto parchment paper. Use directly from the refrigerator (no thawing required). There is no need to mess up your counter with flour, and no need to drag out the rolling pin. Wewalka is already the perfect thickness. 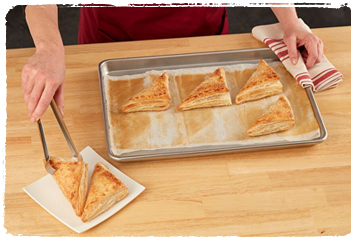 Easily cut to the appropriate size to bake up exceptionally airy and flaky pastries that are perfect for sweet and savory recipes. 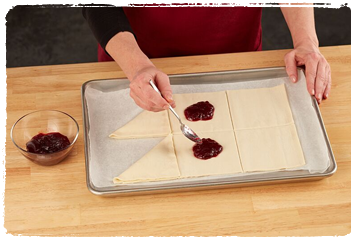 Create impressive strudels, turnovers and florets or wrap over seasoned meats or cheeses for unforgettable desserts, entrées and appetizers. Wewalka’s innovative soft packaging sleeves allow you to feel the freshness. Inside, our dough products are neatly rolled onto parchment paper for your convenience. You’ll never find our dough crammed up in cans that explode onto your countertop. We use real, live baker’s yeast which needs to slowly release carbon dioxide, so we’ve added specialized valves to the packaging. Our yeast ensures your pastries and pizzas always rise up and bake to perfection. 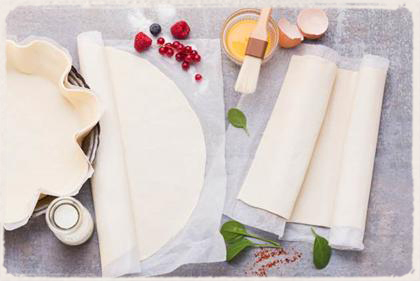 Serving up bakery style creations couldn’t be easier thanks to Wewalka’s time-saving parchment paper. This baking breakthrough not only makes cleanup a snap, it also provides a number of helpful benefits to put the icing on the… pastry. There’s no more sticky dough that must be separated, stretched or re-formed. Simply unroll, add your ingredients and bake. With no annoying cans to deal with, this may actually be the best thing since sliced bread. Bake your recipes right on with the parchment paper on the baking pan, without the need of greasing, buttering or spraying the pan first. There are no food remnants to work around, and your baked items will never stick to the baking tray. Note: It is normal that the paper gets brown in the oven, but don’t be scared – it is oven safe up until 500F. Clean up is as simple as pitching a paper wad. Simply remove the paper from the pan and you’re done. That’s it.